Hi, it's day 16. 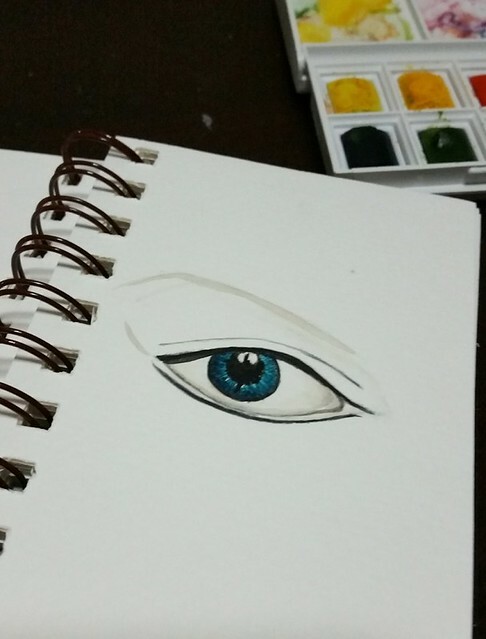 Today I watercolor my favourite drawing: eyes. I always love sketching eyes, especially realistic eyes. I have sketched different manga eyes and realistic eyes with pencils many times. But this will be the first time that I drew one without pencil or pen. Just with watercolor brush. Not easy to draw fine lines especially the lashes with a brush. The reason why I love to draw eyes is they convey emotions. Most times you can tell a sincere pair of eyes from ones that are not. When one is down, you can see the sadness emitting from the eyes. When you are happy, one can easily tell from the joy emitting from it. Today I drew an intense eyes, inspired from Pinterest again. This pair of eyes tell of a determination, like conveying a message that "I'm serious about this!". 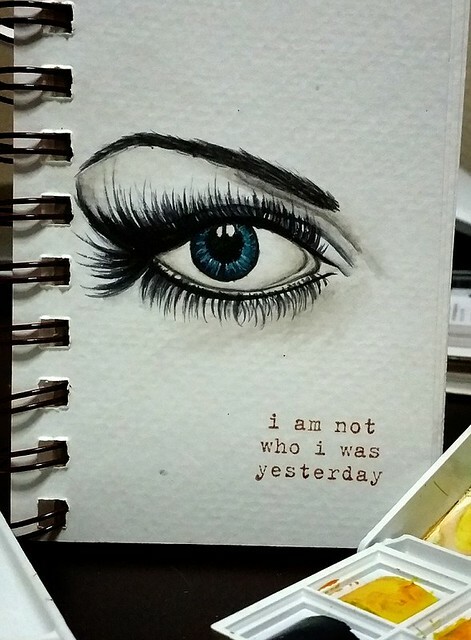 And what I want to convey is I am not who I was yesterday. Every day is a new beginning and everyday we are changed by what we have gone through the day before. We learnt new things, experience different emotions and events that shape us. Today, I want to share a work in progress. Something different. I first used a lighter color to draw the basic shape then went in with darker colors to outline. Then I do the shading and add the eyeball color (drawing in lines instead of one patch down. hope my explanation is clear :P). Then add in the lashes and the shadows. Here's the end result. Also added some white in parts of the eyes. Love it. Yeh.. So glad to challenge myself. And I think I want to get a bigger Winsor and Newton watercolor palette. Really love this palette. Learnt to mix different colors. In the set theres no black color so I have to mix my own with burnt amber and ultramarine. Also mix the eyeball color with ultramarine and viridian hue. Good to stretch myself in color mixing (something that I'm weak in). Ok. That's it for today. Hope you are inspired to try watercolor. Have fun.